The Fokker F.27 Mk.050 was developed as the successor of the F-27 Friendship. The Fokker 50 is based on the fuselage of the F-27-500, but incorporates a number of key design changes. Foremost of the improvements were the Pratt & Whitney Canada PW125 turboprops driving advanced six blade props, giving a 12% higher cruising speed and greater fuel economy, and thus range. Two prototypes were built based on F-27 airframes, the first flying on 28 December 1985. The first production aircraft flew on 13 February 1987; certification was granted in May 1987. A total of 205 Fokker F.27 Mk. 050 were built. Production ended after Fokker collapsed due to financial problems on 15 March 1996 and the last Fokker 50 was delivered to Ethiopian Airlines in May 1997. On 13 November 1014, Peruvian Naval Air Service ( Servicio Aeronal de la Marina Peruana) Fokker 50 AE-567 was seen in front of the specialized painthangar of QAPS (Quality Aircraft Painting Services) at Lelystad Airport in the Netherlands. Fokker 50 AE-567 was parked pending its delivery flight to Peru along with its sister ship AE-568. Both Fokker 50 aircraft were part of the KLu VIP fleet until they were withdrawn from use by the Royal Netherlands Air Force in 2012. Both aircraft entered service in 1996 and were operated by 334 squadron out of Eindhoven Air Base. Both aircraft were equiped with communication, navigation and identification equipment. Fokker 50 with serial U-05 could accommodate 25 passengers, its sistership U-06 could accomodate 30 passengers. Fokker F.27 Mk.0502 c/n 20253 flew first on 18 May 1992. The aircraft was registered PH-KXO as a Fokker F27 Mk050 with Fokker Aircraft BV, Amsterdam, on 8 May 1992. Registration PH-KXO was cancelled on 11 December 1996 and the aircraft received the military markings U-05 with the Koninklijke Nederlandse Luchtmacht / Royal Netherlands Air Force. Fokker F-50 U-05 was named "Fons Prior". On 8 August 2012, both Fokker 50 aircraft U-05 and U-06 were withdrawn from use by the Royal Netherlands Force and offered for sale. In September 2012, both were parked at Lelystad airport pending their sale, and kept in an airworthy situation and flown on a regular base. 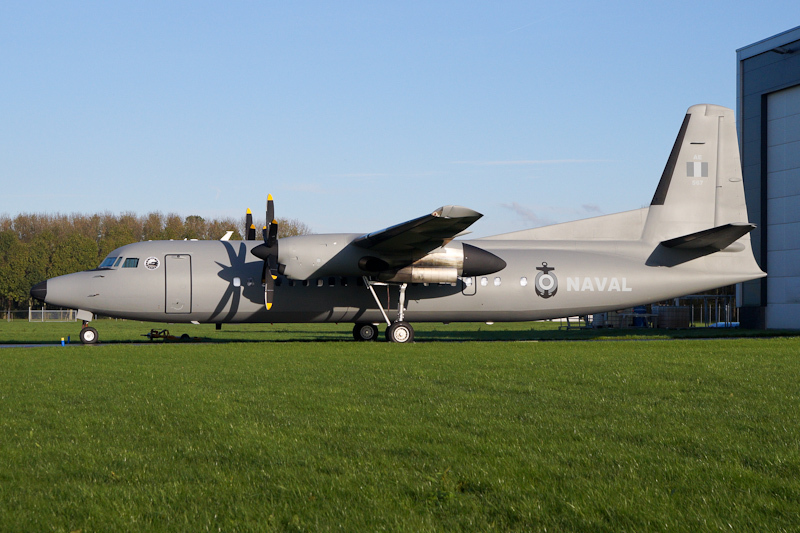 In September 2014, the Fokker 50s were sold to Peru for use by the Peruvian Navy. The aircraft were painted by QAPS at Lelystad Airport in the Peruvian Naval Air Service colors and registered AE-567 and AE-568 in November 2014. However the prefix AE in the registration of the aircrafts stands for Avión Electrónico (electronics-equipped aircraft) it appears that both AE-567 and AE-568 will be used by the Peruvian Navy as Utility Transport Aircraft (UTA). Both AE-567 and AE-568 carried the emblem 'Marina de Guerra del Peru - Esquadron Aeronaval Nr.11'.